When “The Coming Anarchy” was published in The Atlantic Monthly in 1994, it was hailed as among the most important and influential articulations of the future of our planet, along with Francis Fukuyama’s “The End of History” and Samuel P. Huntington’s “The Clash of Civilizations.” Since then, Robert Kaplan’s anti-utopian vision of the fault lines of the twentyfirst century has taken on the status of a paradigm. 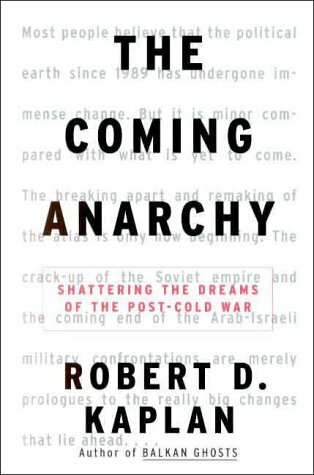 “The Coming Anarchy” has been hailed as the defining thesis for understanding the post-Cold War world. The Coming Anarchy takes on some of the most difficult issues we will be grappling with and living through in the next century. When we speak about the resurgence of ethnic violence, the social pressures of disease, environmental scarcity and overpopulation, and the rise of criminal anarchy, we are using language that Robert Kaplan brought into our homes. In “Was Democracy Just a Moment?” Kaplan offers a fierce indictment of American plans to export democracy abroad, in places where it can’t succeed. In “Idealism Won’t Stop Mass Murder,” he looks with a clear eye at the consequences of the new Holocaust mentality in American foreign policy. In “Proportionalism,” he lays out boundaries for a successful policy toward the developing world. And in “The Dangers of Peace,” he proposes a theory of war and peace in the modern world and a vision of the future of the United Nations that will be as controversial as “The Coming Anarchy” was when it first appeared in The Atlantic Monthly. Impassioned, iconoclastic, visionary, and stubbornly original, The Coming Anarchy will be one of the most important and controversial books of the new century.